In the last contributions I´ve written on my first blog named clay oven, there were topics like the diversity and similarities of antique gods. They´re written in German and not translated into English yet, but if there is some interest, let me know and I would gladly manage to translate these thoughts as soon as possible. Today the topic is about very old gods that have a lot in common with nature itself. Presumably, before mankind even started to imagine gods as “persons”, there might have been the imagination, that everything has its grateful place and time and divinity, even the clouds in the sky and the trees on the ground. “Gods and wind” or “gods of wind”, “wind gods” is a very, very old idea of imagining God. I would even say, this kind of thinking is somewhat closer to human reality than the idea of a single man with a long beard reigning in heaven on a golden throne. The wind is real. It surrounds you when you open the window or go outside. You can feel it on your skin. It blows, it raises, it ventilates, it circles … it moves the leaves of trees, it shifts even ships or windmills, today: giant wind turbines. How did people in former times imagine the wind? What was its character like? And how come that the modern world only sees it as a value of calculation for the weather? In ancient times, the world was stuck with wind and weather gods of quite different names. For example Iskur (Sumerian), Adad (Akkadian), Tessup (Hurritic), Thor (Nordic), Djaramulun (Aborigines), Chaak (Maya), Anemoi (Ancient Greek) … and so on. Probably the oldest known God is the Sumerian storm god Iskur (Adad). You may still join him today in crossword puzzles. Copy of Assyrian7th century B.C., the Sumerian version goes back to the second millennium B.C. The Sumerian god Iksur / Adad had a bull as a symbolic animal (sometimes also a liondragon) and a wife named Hepat and/or Shala, a kind of “earth-mother”. The English version is far more extensive. If you are interested in the “marriages” of Weathergods, you may like to read a Wikipedia entry about “Mother Earth” or “Mother Goddesses”. Very extensive and detailed – and still under discussion – in my opinion, great work is done here for the consciousness of forgotten, female gods. Of course, it is very difficult to name the Aborigines way of thinking or imagination “gods”. There is, however, the idea of a “god” named Djaramulun who is responsible for thunder, as far as Wikipedia is properly informed. I think there is still need for research, especially when it comes to their wives. The picture above includes the ancestors/gods Namondjok, Namarrgon (“Weathergod”) and his wife Barrginj. At the very outset of religion – it´s difficult to determine this “beginning” in time – there were in many areas of the world, where people lived, that worshipped the idea of the goddess “Mother Earth” and a God of “wind/rain”. This seems logical, especially when one thinks that the rain and the earth fit very well in terms of fertility. Still today it is a good sign when it rains a little at a wedding. Especially if you want children. In ancient Europe, the idea of weather gods and their wives has transformed in time. Adad and his wife became forgotten and/or changed into several gods, “Hera/Zeus” or “Juno/Jupiter”. To be seen especially in the property of Jupiter as “God of thunder”. There is a mythical story about the pictures above: Semele and Jupiter had an affair, but Semele was not aware who came to her night after night. Juno was not amused about the escapades of her husband and used an intrigue. Semele herself asked Jupiter to show up in all his splendor and force. Because he had promised so, Jupiter had to do it, although he knew something bad would happen. 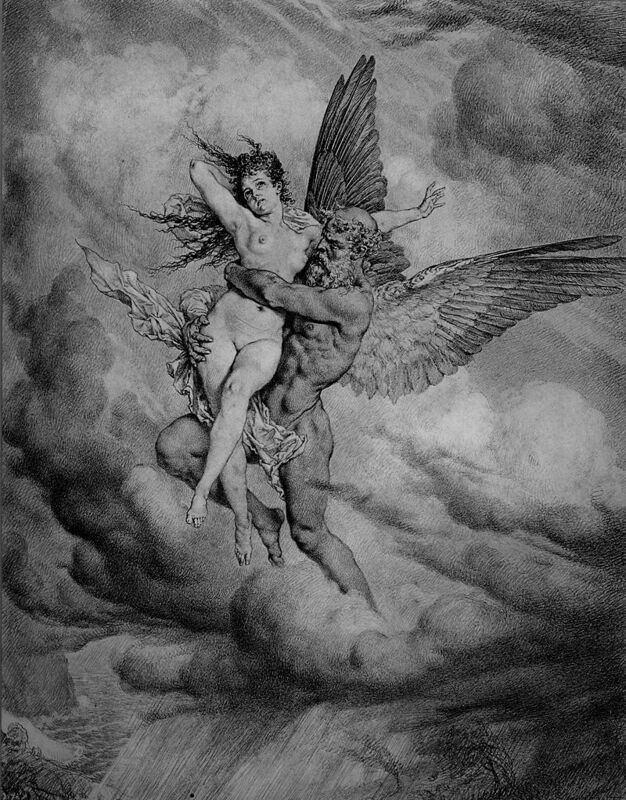 He revealed himself as thunder and lightning being – and Semele died. What then happened might be called manly emancipation. For Semele was pregnant with Dionysus/Bacchus and Jupiter did not let the child down but locked it in his thigh (! ), from which it was then born in due time. After birth, Jupiter gives it to another emancipated man and adoptive father: the Satyr Silenus. Considering historically that the Dionysian festivals were a feast until late antiquity, where women were going wild and outer edge … well, I digress. In ancient Greece (and also Rome, whereby I restrict myself now to the Greek winds) there were the so-called “Anemoi”, which at about the same time (4th century BC) their more technical variant, the compass, became available. Again, it should be pointed out that these winds exist not only in European antiquity, but also – in other forms – in the Mayan, Chinese, and even Aborigines culture. There are much more “Anemoi,” but these four can be safely counted among the main gods. According to legend, they are derived from Eos (Roman Aurora, the goddess of dawn) and Astraios/Aeolos, a titan, and god of the dusk/wind god. Between Astraios and Aelos there are some overlaps. Possibly the gods of wind are also not “children”, but brothers of Astraios/Aeolos. And because of the ancient division of season in only three phases, the wind Eurus existed later than his brothers. Aeolos is commonly known as the patriarch of the Greeks. Around Boreas and the Zephyr, there are different myths about women’s breeches. Boreas actually derived from Thrace and becomes the son-in-law of the Athenians by the robbery of Oreithyia. Later, he helps them destroy the entire Persian fleet. The Zephyr has a hanky-panky with Chloris, from which Flora emerges, a spring deity. Very beautiful to see at Botticelli: the third group of persons in the picture on the right side (Zephyr, Chloris, Flora – left to right). But especially in the case of Zephyr, it depends on which ancient authors you read. There are countless other stories about him and women. There are also as many other wind stories as stars in heaven. One of them the www-wind was blowing right up to me and I will take a last, outside European course on the subject. The fairy tale comes from Japan and is called “green willow”. The www-wind has blown it to me when I was searching for “thunder”. I met this little story collection, wherein is also a Japanese fairy tale about thunder. (The good thunder). Here you can read it all – written in English. The story “green willow” it is about love, disobedience, and honor. The willow is (probably) the pretty protagonist herself. In the story of the good thunder, the supreme Japanese Thunder God sends his son to the earth, who decides to live with ordinary people. References to Philemon and Baucis or even Jesus can not be dismissed. … I do not want to reveal too much of the content, especially since I have to think about it for a while. Perhaps there is a kind of “basic truth” hidden in all the ancient tales of the world? I really do wonder about all the similarities of weather Gods that – despite the differences – are so obvious! The following picture is absolutely brilliant and I had already thought about using it for the cover of my novel “Amor and Psyche”, but I guess I will choose a reduced, more cute variant.